As we head into another year, we want to begin by seeking God together in a season of repentance (about 10 weeks), kicked off by a concentrated, three-week season of fasting and prayer starting on January 13th. On the first Sunday of the year, Barry will introduce the time, helping us to get on the same page and offering some practical suggestions for ways in which this period can be fruitful for us individually and as a church. The main goal: to be as available and open to God as we can be. Our message series will be in Revelation 1-3. What is the Holy Spirit saying to the churches? Will we have ears to hear? What would it look like for us to learn to become overcomers? 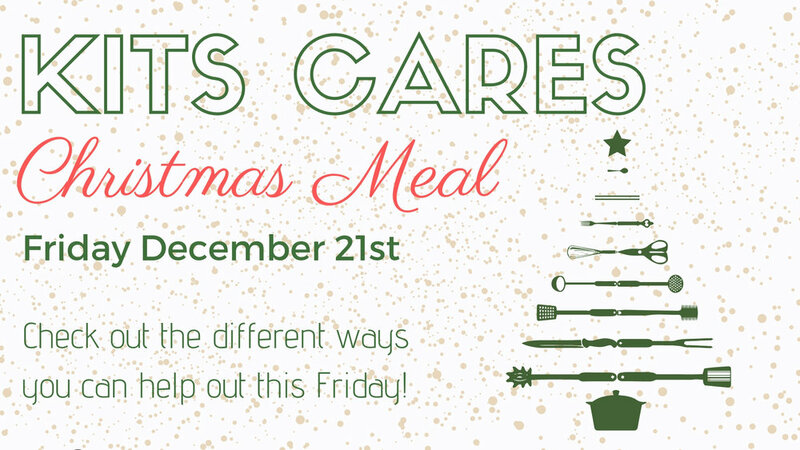 This Friday is the last meal of the year for Kits CARES! Its also our Christmas meal! We are still looking for some volunteers for this evening so if you’d like to help please email Maria. So join us for a merry night of fun, good food and hospitality! Check out this link to learn more about Kits CARES! There are a few Christmas meals happening around the Kitsilano neighbourhood this holiday season. If you’d like to donate your time, check out the dates and locations below and email Maria to sign up! December 25th Redemption and Kits Cares will be partnering with Tenth at Kits Church to host their annual Christmas Day meal! So if you want to give the gift of time this Christmas season there are quite a few opportunities. We have so many wonderful skills and gifts to share with our community! Check out everything there is to know about this Advent Season! It is a program designed by a number of Kitsilano Churches to address hunger and social isolation in the Kitsilano Neighborhood. A weekly meal jointly hosted by nearby churches at the Kitsilano Neighborhood house located at 2305 West 7th Ave.
Every Thursday evening, with doors open to the community from 5:30-7:30. Volunteer hours change according to role. To meet an acute need for nutrition. Kitsilano and surrounding neighbourhoods are home to a surprising number of unsheltered and other highly vulnerable people (pensioners, widows, the disabled, mental health patients, etc.) who are struggling with poverty- related challenges. Regular access to a nutritionally-appropriate meal made with quality ingredients is essential for general health as well as other life outcomes. To help satisfy a deeper hunger. Loneliness afflicts many Vancouverites, and hits low- income people and young adults hardest. Community meals if they're carefully organized to foster mutually transforming relationships - are amazing environments for creating a sense of belonging for socially isolated neighbours. Jesus has reminded us that "no one lives by bread alone." Shared meals can offer a genuine taste of the shalom Jesus invites us into. To Find Joy in Working Together. Jointly offering a meal to our most vulnerable neighbours can help us experience the joy of recognizing Christ in each other. For more information about each role check out this link! Email maria@redemptionchurch.ca for any questions or more information! Yes, it is that time of the year again! Daylight savings ends at 2:00am on Sunday November 4th! Don’t forget to set your clocks backward by one hour. Redemption Church hosts a weekly play group for parents with young children. The play group offers a safe, engaging space for children and an encouraging and supportive environment for their parents. Being involved with this group is an a opportunity to connect and build relationships with families in the community. 1. Host - The group is looking for an able bodied person to set up and host. 2. Parents - Parents with young children, come hang out! Starting October 4th and running until October 21st, we will be accepting photo entries which capture our church and community. Past: Photos of our church's history. Were you present at The Hollywood? Do you have pictures of U-Town services or PGCC back in the day? Present: Photos of our recent events, parties or other fun times that you’ve enjoyed with your church family. These can be oikos moments, volunteer days or even just a regular Sunday. A $20 gift card prize will be available for each of our two category winners and the top five submissions will be shown to the whole congregation on Sunday October 28th during the service. Please send your submissions to Maria along with a description of the photo, submission category, date/year and your name. Follow us for more weekly updates! Redemption Church has quite a few books that are available for you to check out and enjoy! You can take a look at what's in our library by following the link below. To create an account so you can check-out books or put them on hold please contact Maria.